Theresa May's announcement is the latest dramatic turn in the United Kingdom's three-year Brexit crisis. British Prime Minister Theresa May said on Wednesday she would quit if her twice-defeated EU divorce deal passes at the third attempt, making a last-ditch bid to persuade rebels in her Conservative party to back her, one of her lawmakers said. May "will go if deal gets through," said the lawmaker, who spoke on condition of anonymity. "Suggests she goes after a deal." May was addressing a meeting of the 1922 Committee - in effect her parliamentary caucus. Another Conservative lawmaker said that, while May had not given a date, the impression was that she would go "reasonably soon". A third Conservative member of parliament said May had told the meeting that she would hand over to a successor to negotiate the next phase of Brexit - future relations with the EU, notably a wide-ranging trade agreement. May's announcement is the latest dramatic turn in the United Kingdom's three-year Brexit crisis, but it is still remains uncertain how, when or even if it will leave the European Union. Many of the Conservative rebels who want a cleaner break from the EU than May's deal would deliver had made it clear that they would only consider supporting her agreement if she gave a firm commitment and date for her resignation. May, a vicar's daughter, had already promised to step down before the next election, due in 2022. By agreeing to go sooner, she increases the chances of her EU deal passing before the new April 12 deadline. The government is now expected to bring the deal back to parliament for a third vote on Friday. May's deal means Britain will leave the EU single market and customs union as well as EU political bodies. But it requires some EU rules to apply unless ways can be found in the future to ensure no border is rebuilt between British-ruled Northern Ireland and EU member Ireland. Many Conservative rebels have objected to this so-called Irish backstop, saying it risks binding Britain to the EU for years. But given the choice between the backstop and no Brexit at all, more should come round. Some of the party's most influential dissenters had already indicated they would back her deal, agreed after two years of talks with the EU, saying it was the least-worst option. May's deal was defeated in parliament by 149 votes on March 12 and by 230 votes on January 15. 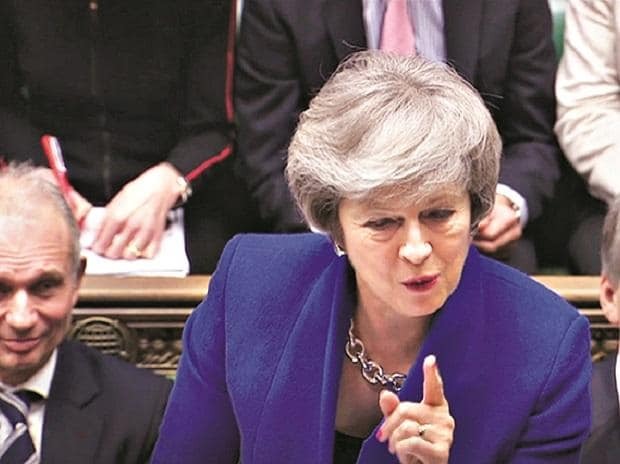 While May was telling her lawmakers of her intention to quit in a parliament committee room, MPs in the main chamber debated eight Brexit options ranging from leaving abruptly with no deal to revoking the divorce papers or holding a new referendum. Several options on the table would see much closer alignments with the EU than May has been willing to consider, including staying in the common market or a customs union. They will vote at 1900 GMT on a ballot paper for as many proposals as they wish. Results will be announced after 2100 GMT. The United Kingdom was originally due to leave the EU on March 29 but last week the EU granted an extension to the divorce date until April 12.